A pastel-inspired wardrobe works whether you are lounging around on a lazy Sunday or attending a black tie affair. Here are a few of my favorite evening wear and casual pastel looks. I was quite shocked to see so many soft pastels on the runway, especially on NYC runways, where edginess and experimental fashion abound. But just as sorbet is a cleanser to the palette, I felt that the softer hues debuting for spring cleansed my fashion palette. What are your favorite Spring 2012 looks? Do you like pastels, or do you opt for edgier choices? Obsessed with all these images of pastel! Gorg picks! Hi there! Thanks so much for stopping by TCB today! So glad to see you! 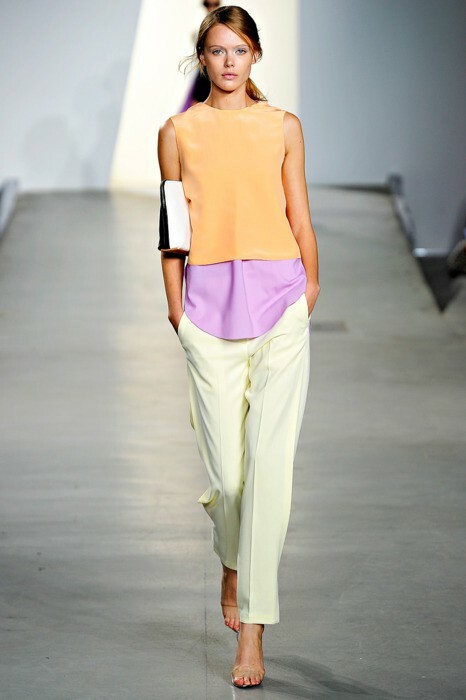 I'm loving the Philip Lim runway pastels. Great color blocking. Ohh, loving the pastels! So feminine, soft, and pretty. Great inspiration here! GORGEOUS post, pastels are my absolute fave! I can't wait til spring! I'm not quite ready for spring...but this is getting me pretty excited!! great post! I'm a fan of anyone who chooses to wear something besides black. don't get me wrong, black is fine, but not all the time! I can't wait to try the trend this spring. You have such amazing inspirations here -- and in my mind, DVF can do no wrong! The DVF images are blowing my mind! So gorgeous! Thank you for your comments on my blog. I certainly love designing boxes. I absolutely adore pastel colors!! They're so charming and sweet and remind me of macarons! I can't wait for spring and warmer weather to burst out lighter colors as well! But for now I think i will stick to darker hues and jewel tones to brighten up the winter! !